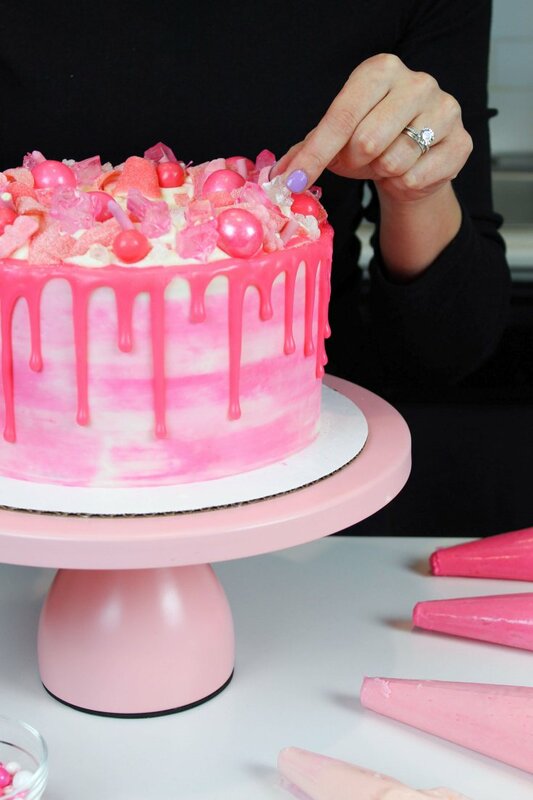 A few weeks ago, I had a very special opportunity to make a pink drip cake for a special shoot with Instagram! 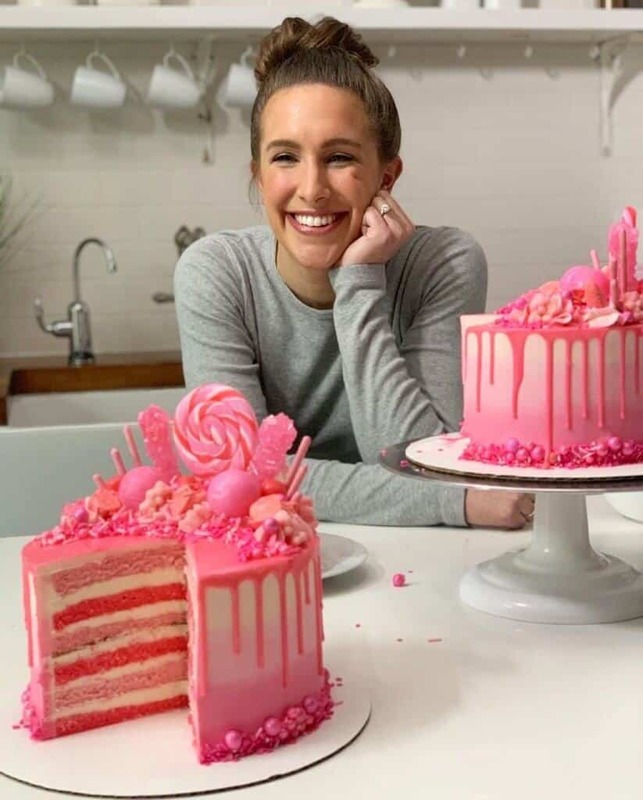 I spent a day on set with an amazing production team, making two identical, monochromatic pink drip cakes. The two cakes were shot from different angles, to make an amazing short video about a new feature for IGTV. It was sent to everyone who has an Instagram account, which is pretty mind blowing!! Since I had tons of leftover candy and pink white chocolate ganache, I decided to make and film a version of this cake for all of you!! It’s decorated in a slightly different manner, but is still just fun. 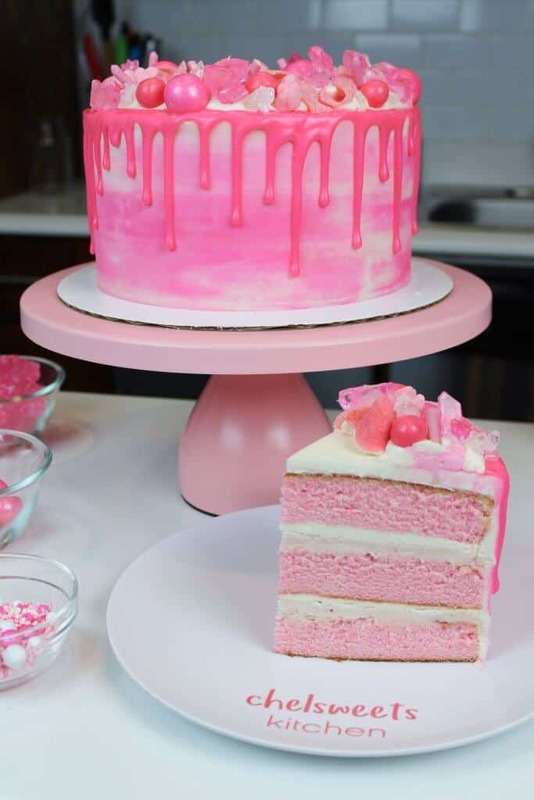 While this was a pretty unique situation, this pink drip cake is perfect for so many other occasions too!! 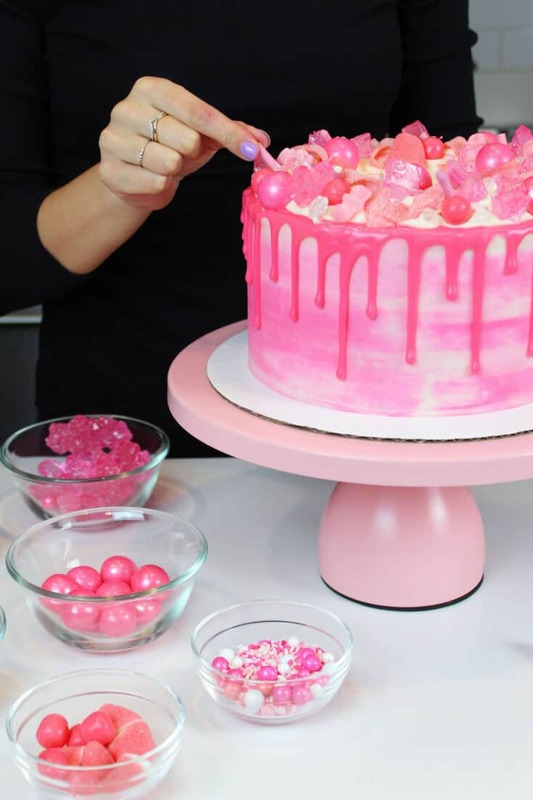 Whether it’s your daughter or niece’s birthday, or you have a friend who is obsessed with the color pink, this cake is a wonderful way to celebrate. It only seemed fitting to make this cake with some pink cake layers! I used my favorite vanilla layer cake recipe, which comes together in one bowl. This cake recipe uses buttermilk, which makes the layers super moist. To make these cake layers pink, I simply add some pink gel food coloring! Liquid food coloring can work too, but you won’t be able to get as strong of a color. You also can throw off the consistency of the vanilla cake batter if you add too much liquid food coloring. Gel food coloring is incredibly concentrated, so it allows you to use less. To keep things simple, this cake is frosted with my american buttercream! I love the that is only uses five ingredients, which most of us already have in our pantries! This is also the easiest recipe to make! It’s pretty much foolproof, and only takes about 5 minutes to make. The frosting is colored with the same pink gel food coloring that’s used to color the cake layers. Now for the most exciting part of this cake, the pink drips!! I use my colorful drip recipe to create this gorgeous, dripping look. It’s made using just three ingredients! All you need is some heavy cream, white chocolate, and pink food coloring. To make sure you nail this drip look, it’s imperative that you chill your cake, and do a test drip. This helps ensure your ganache is the right temperature. For all of the visual learners out there, you can also check out my detailed drip cake tutorial for more tips. If you try this recipe, please tag me @chelsweets, and use the hashtag #chelsweets, so I can see your beautiful creations!! 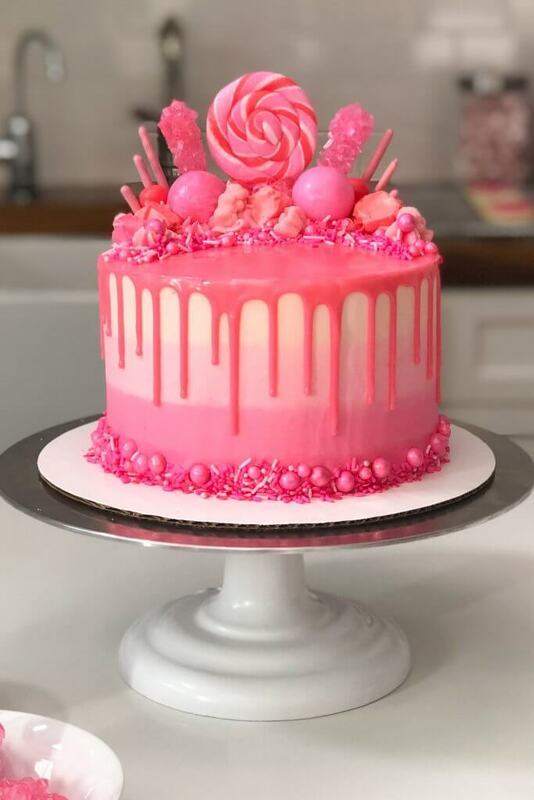 Whether you're celebrating a baby shower, birthday, or just love the color pink, this vanilla pink drip cake is perfect for so many occasions! Preheat oven to 350°F. Line three eight-inch pans with parchment rounds, and grease with non-stick cooking spray. Add in a generous squirt of pink gel food coloring. Mix the batter on a low speed, scraping the sides and bottom of the bowl part way through to evenly color the batter. Bake for 34-36 minutes (or until a skewer comes out clean). Allow to cool for 10 minutes, then run an offset spatula around perimeter of the pan to separate the cake from the pan. Place cake layers into the freezer for 45 minutes, to accelerate the cooling process. Wait to color the buttercream pink with gel food coloring until you've filled and crumb coated the cake. The white buttercream will have a great contrast against the pink cake layers. Heat heavy cream in a heat-proof bowl in the microwave for 45 seconds, until it's just beginning to bubble. Gently pour white chocolate chips into the heavy cream, making sure they are fully covered with cream. Allow mixture to sit for 1 minute. Stir slowly until the cream and white chocolate are combined. Some bits of chocolate may not be fully melted yet. Heat the mixture again for 20 seconds, and stir. Repeat as necessary until all the chocolate bits are fully melted and incorporated. Add in the pink gel food coloring, if desired. Allow to cool until desired viscosity is reached (barely warm to the touch). If it seems too thin or thick, you can add a touch more chocolate chips or heavy cream! The type of cream and white chocolate that you use can affect the consistency, so feel free to adjust as needed. Add a second, thicker layer of frosting to the cake, and smooth using a bench scraper. To create a watercolor look, color a half a cup of frosting a medium shade of pink, and another half cup of a frosting a deeper shade of pink. Dab the pink frosting onto the second layer of white frosting. Smooth with the white buttercream, to blend the colors together. 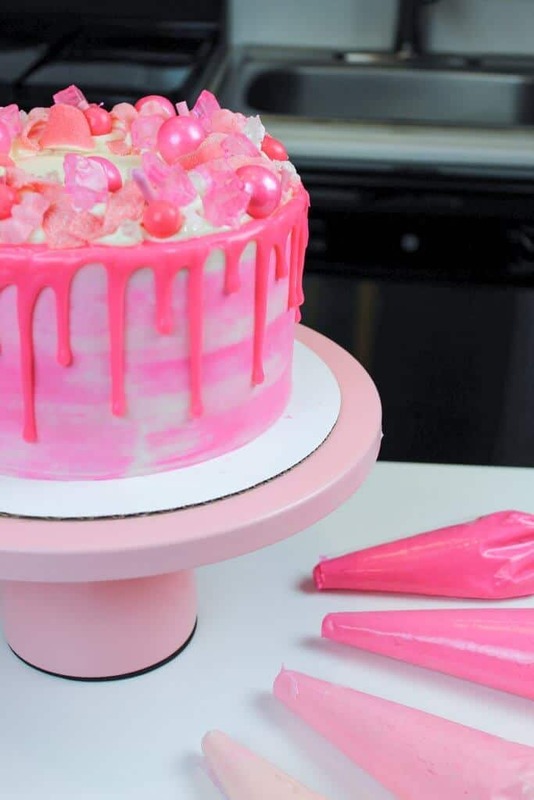 Add the pink drips to the cake using a plastic squirt bottle. Then decorate as desired with assorted pink candies. Once the layers have fully cooled, I sometimes like to trim the caramelized bits from the sides of the layers using a serrated knife. While these layers bake pretty flat, sometimes I’ll also trim the top of the layers too. Next PostHow Long Does Buttercream Last?